For Christmas, Bill gave me a cookbook. It's the companion volume to a PBS series about baking, hosted by Julia Child. The book is called Baking With Julia. I've been looking for some time to play with this book since then and today, I jumped right in with the first recipe in the book, white bread. It is delicious! The recipe suggests using a stand mixer with a dough hook. 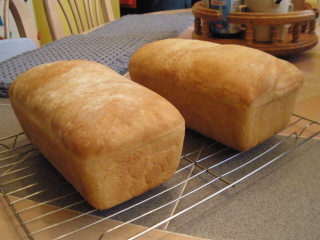 Unfortunately, I only have a hand mixer so I was forced to bake bread the way our ancestors did, by hand. I stirred the dough until it held together, then kneaded it by hand for ten minutes. Our ancestors must have had strong arms! I'm delighted with the results. Next, I'd like to bake whole wheat bread, vanilla pound cake and a really wonderful recipe, Cranberry, Walnut Pumpkin bread. It sounds like a quick bread but it is in fact a yeast bread. Cute, right? 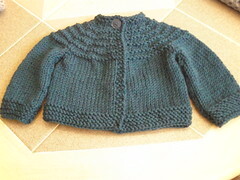 This pattern is the Baby Boy 5 Hour Sweater. I don't know how long it took to knit this. I don't document the hours while I'm knitting. It was fast, though. 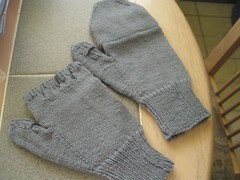 I started it on Wednesday afternoon and finished it Friday morning. Didn't push it, either. I think I'll use this pattern again. P.S. This is a gift for Brian's sister. Her baby shower is being held today. And the little stocking cap? Also for a baby shower, for my husband's niece. And another thing. It's warmer today. Why are my feet still cold? I've been trying to work myself up to this point for awhile. I tried to get started, halfheartedly, and achieved nothing, naturally. Since New Year's day, typically a day to think about what you need to do and haven't done, I've been thinking about why I haven't succeeded. I think part of the reason is that I was keeping this decision to myself. I was doing this because if I failed, I felt I wouldn't have anyone to answer to except myself. So, now I have the blog community to answer to. This weight problem thing was never an issue when I was growing up. I was thin, sometimes painfully so, and could eat whatever I wanted. When I was pregnant, I never gained more than about 25 pounds and never kept more than 5 after they were born. It's only as I've gotten older, and now that menopause has reared it's ugly head, that I really started to gain. It's bothered me but not enough to get serious enough, evidently. Recently, though, I started medication for cholesterol control. Ugh. It's time to make a change. I'm too young to feel this sluggish. So, here I am. One pound lost and I'm on my way. Wish me luck! How cute is that? 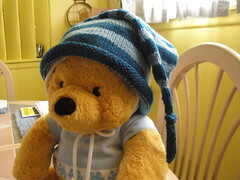 A baby stocking cap for...well, I'll share that after the gift's been opened. 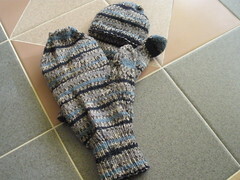 ...this pair for Kelly. I should have rethought the idea of using the jacquard design sock yarn, though. It was a bit hard to match up on each glove. It was not bad. Probably, I'm the only one who can see the difference between the two. 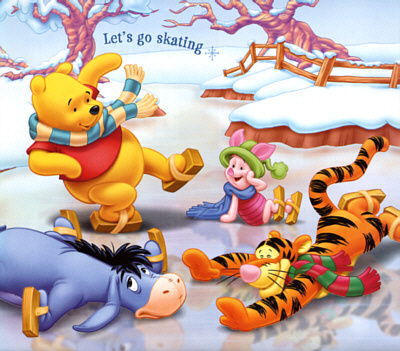 Pooh and I are hoping for slightly warmer weather. Ok, I know it's winter but wow. It's been frigid. Warmer temps are promised, possibly tomorrow?? A new year, a new decade, a new beginning....I hope. I've been thinking a lot about this journal lately. I've never been entirely satisfied with it. I don't think I'm a very good writer, to begin with, but I think the biggest problem is that I don't feel comfortable writing about myself. I sit and stare at this computer and wonder what is interesting enough that people will want to read it? What is there about me that I'm willing, and able, to share with the world? I'm sure there are tons of blogs out there, some interesting, some not. What makes a blog interesting? The person? The writing? Experiences? My task this year is to decide how this blog will evolve, if it does. Do I have something to say?